Every year, it’s one of the first signs of warmer weather. The annual opening of farmers markets has arrived. 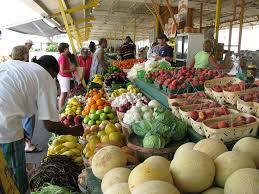 Farmers markets are a great place to buy locally-grown produce and other food. The fruits and vegetables sold at these markets often have established rules requiring only locally-grown items. This ensures residents getting the freshest and best-quality items for their money. Farmers markets in the Upstate of South Carolina and their staff are available to answer all your questions about healthier eating. The Clemson Farmers Market, open on Fridays from 3 p.m. to 6 p.m., offers local and fresh farm products and produce. They also offer cooking demonstrations and live entertainment. Folks closer to the Anderson Farmers Market can visit on Saturdays, from 10 a.m. till 2 p.m. in May. From June till November, they will be open from 8 a.m. until 1 p.m. on Tuesdays, Thursdays and Saturdays. The Powell Group invites everyone to feast on the locally-grown and delicious food. While there, you may also view any of our area’s beautiful homes. Our team members are here to answer any housing questions or concerns you may have.